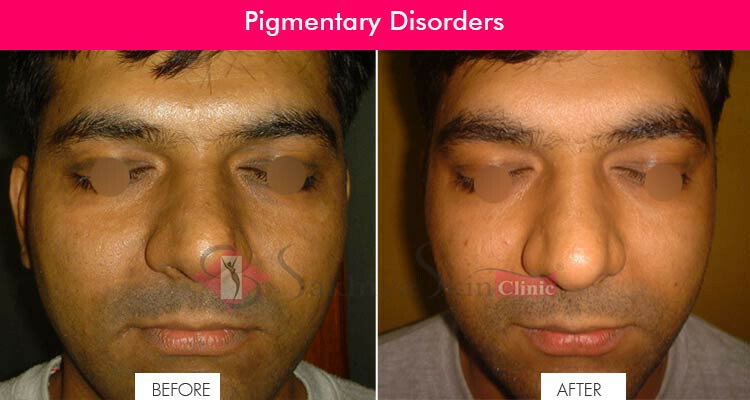 Pigmentation is a general term used for both darkening of the skin or lightening of the skin. This is another common problem faced specially by women. Pigmentary disorders are a main cause of concern while trying to achieve a smooth, flawless skin. Skin coloring diseases can be of two types- melasma or vitiligo. Learning about both the symptoms of both these diseases may help in choosing the right skin treatment for it. Melasma or hyperpigmentary refers to the darkening of the skin color. This may happen due to unusual exposure to sun or certain hormonal changes. This skin disease usually occurs in pregnant women and sometimes it gets cured on its own after some time of the childbirth. Vitiligo or hypopigmentary refers to the lightening of the skin. This is a more complex problem and may occur anytime after childhood to the adult age. Her the complete skin or some patches may become lighter than the others and give an uneven tone. Pigmentation on the skin needs to be diagnosed by the dermatologist. Pigmentation can be only on the surface i.e. epidermal or deep inside i.e. dermal. Skin Treatment prescription will depend on the type of disease that you are facing. Some of the most popular solutions for depigmentation are laser therapy and chemical peels. Laser therapy can be used to lighten the skin color from the surface . A chemical peel is applying certain solutions that lead to the peeling of the outer skin. The new skin that develops has lighter tones of melanin and hence does not appear as dark as earlier. Sometimes a dermatologist may recommend a combination of both laser therapy and a number of chemical peel sittings for optimum results. As mentioned earlier, causes of depigmentation maybe genetic, hormonal imbalance or excessive exposure to the sun. Hormonal changes lead the pack here and hence approximately 80% of the pregnant women may face this problem during their pregnancy. While other skin diseases may sound more complex, pigmentation is the one which affects a large number of population and makes the appearance less than luminous. Uneven skin tone, dark spots, and patches are the most commonly found skin problems. While they may affect any of the body parts, they usually occur on the face which further aggravates the issue. Skincare at the proper time, taking care of applying sunscreen when stepping out and following doctor’s advice are the best way to get a clear skin.